Although may people use the terms jail and prison as synonyms, there are actually significant differences between jails and prisons. Jails are normally operated by a local government, usually a county government, and are used to hold people pending trial, or for shorter sentences of incarceration following a criminal conviction. Prisons are normally operated by a state's department of corrections or, for federal crimes, the Federal Bureau of Prisons. Prisons hold people who have been sentenced to periods of incarceration for more serious crimes, with sentences of one or more years in prison. Jails - Jails are used to hold people who are charged with crimes while they await trial, if they have either been unable to post bail or are being held without bail. They also hold people convicted of criminal offenses who have been sentenced to shorter terms of incarceration, normally a year or less. A person may be sentenced to jail for contempt of court. Also, jails hold defendants who have been sentenced to prison, but have not yet been transferred to the custody of the department of corrections. Jails may also hold "material witnesses", people with first-hand information about a crime, who have been determined by a court to be unlikely to appear for trial if not detained. They may also hold people wanted for crimes in other jurisdictions who are being held pending the outcome of extradition proceedings. Prisons - Prisons hold people who have been convicted of crimes and sentenced to incarceration as part of their punishments. Prisons house inmates convicted of more serious offenses, normally with their sentence being of more than one year. Most prison inmates have been convicted of felony offenses, although some states have defined misdemeanors offenses that carry a potential prison term. Many states offer special programs for offenders who are considered to be at risk of committing more serious crimes. For example, an offender might be eligible to be sentenced to a boot camp program that, if successfully completed, will allow the offender to avoid a potentially long period of incarceration and to be released on probation or parole. In some states, these programs will be provided by the state department of corrections, while in other states they may be available through the jail. Although use of the terms "jail" and "prison" is relatively consistent across the nation, exceptions exist that can potentially create confusion. For example, Pennsylvania uses the term "county prison" instead of "jail". 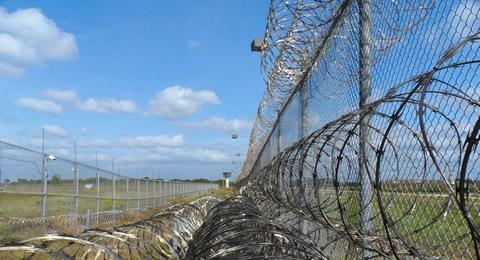 A few states manage both jail and prison services through the state department of corrections. Within those states, some may operate single facilities that house both jails and prisons. Jails are secure facilities that provide shorter-term detention for people who are charged with crimes, or who have been sentenced to shorter terms of incarceration following a criminal conviction or a finding of contempt of court. The federal government operates detention centers, which serve a similar function to jails, providing facilities to hold defendants charged with criminal offenses, or pending their transfer to a prison following conviction. When a suspect is arrested following a crime, the suspect is often taken to jail. Most suspects spend no more than a night or two in jail before being released on bond, so jails deal with a high turnover of their populations. Jail cells are often shared by two or more inmates. Although those sentenced to jail are convicted of less serious offenses, many of those offenses are violent misdemeanor offenses. Also, many pretrial detainees are charged with serious crimes. Due to the mixed nature of jail populations, a jail may be a dangerous environment for a detainee. When a person is first processed into jail, the person is given a basic medical check to see if he or she needs medical attention, perhaps due to injury or intoxication, and to screen for communicable diseases. If the person does not need urgent medical attention, the person is normally processed into jail, having their personal property taken and inventoried, being searched, issued jail clothing, and being placed in a cell. If an inmate may have a communicable disease, that inmate may be held in isolation pending a medical check. If an inmate is determined to have psychiatric issues or to be at risk of self-harm, the inmate may be placed in an observation cell, a special jail cell where the inmate may be constantly monitored. Jails may offer services to help inmates address substance abuse problems or emotional problems, during their incarceration. They may also offer educational programs. However, for reasons that include budget, security concerns, staff levels and the length of a typical jail sentence, the quality and availability of this type of rehabilitative program varies significantly from jail to jail. Weekend sentences - A person is sentenced to serve time on weekends. For example, the inmate may check into the jail on a Friday evening and be discharged on a Sunday evening, getting credit for two days of jail time for each weekend served. Work release - A person is given the opportunity to leave the jail in order to go to work. The inmate may be given a very tight schedule for commute time to and from work. Violation of the program, such as by a late return from work, may result in the loss of the privilege of work release. Prisons tend to be larger than jails and, due to the longer sentences given to prison inmates, often have amenities to facilitate long-term incarceration that are absent from jails. For example, prisons will often have better recreational and entertainment facilities. Prisons may have better programs for substance abuse recovery or participation in 12-step programs. Prisons may also offer better educational programs to inmates than are available in jail, such as GED (high school equivalency) programs, as a significant percentage of prison inmates will be incarcerated for long enough to complete a program. Before being placed in the general population of a jail, a prisoner will go through a period of quarantine. The primary purpose of the quarantine is to ensure that the inmate does not have any communicable diseases that might be transmitted to the general population of the prison. If the inmate is addicted to drugs or alcohol, the inmate may also experience withdrawal symptoms during the quarantine period. When an inmate is sentenced to prison, the department of corrections uses staged levels of security, from "super-max" to community housing to decide where the inmate will be placed. Inmates are housed according to assessment of their dangerousness and risk of escape. Based upon an inmate's record of behavior, the inmate's level of security may be increased or decreased during a prison term. With some security-based exceptions, inmates are entitled to have visitors and to receive mail. Inmates have limited access to a telephone. All mail is subject to being searched for contraband and may be read by prison personnel. Visits and telephone calls may be monitored. Attorney-client communications are generally exempt from being monitored or read by prison staff. As a prisoner's expected release date approaches, the prisoner may be transferred to a low-security facility or a half-way house to help the inmate transition back into society. At the lowest end of the security spectrum, some prisoners may be able to obtain jobs outside of prison and participate in work release programs. Any person who visits a prisoner or inmate is subject to a background check, and may be physically searched before being allowed any physical contact with the inmate. Any items that the visitor wants to take into the visit will be searched for contraband, a term that in the context of a jail or prison includes many ordinary items such as tobacco products, a nail file, chewing gum, cellular phones, or even a pen. In many cases a person who is confined to jail will have better access to visitors than a person sentenced to prison, as most people held in jail are held close to where they live. People who are sentenced to prison are often sent to facilities that are distant from their homes, and even the closest prison may be a considerable distance away from the inmate's home. Even with jail, a defendant may end up being held a considerably distance from home if the defendant is charged with committing a crime in a location away from home, or if a jail transfers an inmate to another facility in order to alleviate issues of overcrowding. Contact visits - A contact visit usually involves the visitor meeting the inmate in a room designated for visitation, where the visitor can have physical contact with the inmate. Some contact visits, such as attorney-client visits, may occur in a private meeting room. Other visits occur in a group setting, typically with the inmate assigned to a table where the visit occurs. Strict rules apply as to the nature and extent of contact with an inmate, and visitors are prohibited from passing unapproved items to inmates. Non-Contact Visits - A non-contact visit normally involves viewing the inmate through a thick sheet of glass, while speaking to the inmate through a telephone handset. Non-contact visits are common in more secure prison facilities, but are also frequently used in jails in order to reduce security issues associated with contact visits. In a small number of states, a prisoner may at times qualify for a conjugal visit, meaning that they may spend a period of time in a private room with their spouse, during which they may engage in sexual activity. In states that permit conjugal visits, the couple is usually required to be married, and to undergo screening for sexually transmitted diseases. A small number of jurisdictions permit extended family visits, which allow for an inmate to meet more privately with family members, including spouses, domestic partners, their parents and children.